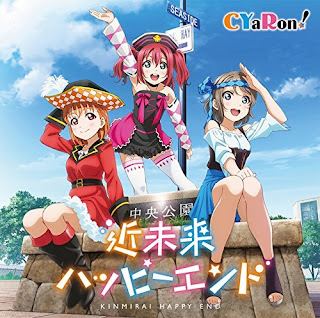 Kinmirai Happy End (近未来ハッピーエンド lit. Happy End In The Near Future) is the second single sung by CYaRon!, a sub-unit under Aqours. The group consists of Takami Chika, Watanabe You, and Kurosawa Ruby. The song was first previewed on the April 21 episode of One, Two, Sunshine!! with CYaRon!. The song is written by Hata Aki, composed and arranged by Fujii Ryouta. Performed by Cyaron!! For report the broken link ? please Comment.